Two of Toronto’s longstanding independent bookstores will face major changes in 2012. This morning, Sue Houghting, owner of The Book Mark in the city’s Kingsway neighbourhood, announced she will close shop after 46 years in business. In a press release, Houghting cites an “unaffordable rent increase and high property taxes” as factors that have made the bookshop, believed to be Toronto’s oldest surviving indie, unsustainable. Houghting is aiming to shut down by Jan. 21, “but if stock dwindles before that we will close earlier,” she says. News of The Book Mark’s demise follows reports that Glad Day Bookshop, the city’s iconic LGBT bookseller, is seeking new ownership. Last week, owner John Scythes told the Toronto Star he’s hoping to find a buyer within his customer base before opening the sale up to the general public. 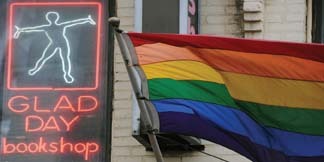 Glad Day, the world’s oldest existing gay and lesbian bookshop, has struggled financially throughout most of its 42 years. A 2010 social media campaign by store staff brought its money problems to public attention. At the time, co-manager Sholem Krishtalka chalked them up to a steady decline in book sales, combined with significant legal fees left over from a decades-long censorship battle with the Ontario Film Review Board.